I. 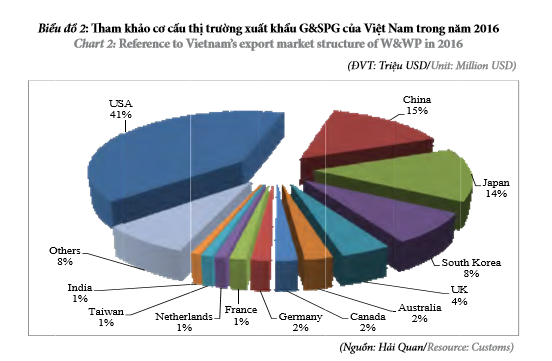 EXPORT - The United States continues to maintain the largest export market of South Vietnam, reaching $ 2.8 billion, accounting for 41% of total exports of the country g & SPG, an increase of 6.93% compared to 2015. - In 2016, exports of G & SPG Vietnam reached nearly $ 7 billion, a slight increase compared to 2015. - Export value of g & SPG FDI reached 3.3 billion US dollars, accounting for 47.37% of total G & SPG export earnings of the country. According to data from the General Administration of Customs, exports of wood and wood products (g & SPG) of South Vietnam in 2016 reached nearly $ 7 billion, up 1.1% compared with 2015, No. 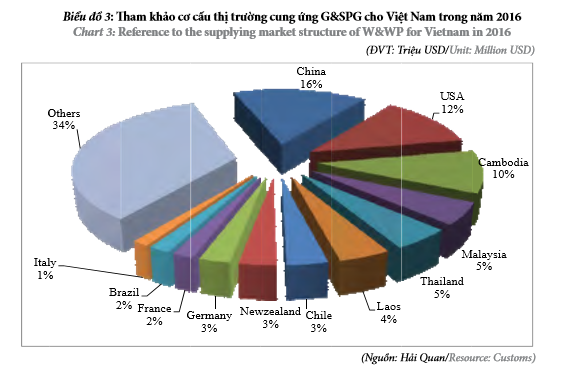 7 in turnover in some commodities / commodity groups, exports of South Vietnam in 2016.
in particular, exports of wooden products reached $ 5.12 billion, up 7.1% compared to 2015, accounting for 73.6% of total g & export value of the whole industry SPG in 2016.
forecast: continued recovery in late 2016, the world economy in 2017 is likely to continue to prosper; many positive signals from the TPP will be positive news to support the export activities of Vietnam SPG g & South in 2017, with growth in exports is expected to reach 7% - 10%. , + 2016, exports of g & SPG FDI reached $ 3.3 billion, approximately the last year, accounting for 47.36% of total turnover SPG g & export of the country (this rate is 47.84% of 2015). In particular, exports of wood products in 2016 reached nearly $ 3 billion, approximately in 2015, accounting for 58.44% of total export turnover of wood products nationwide. + 2016, the United States continues to be the g & export market of Vietnam's largest SPG South, reaching over $ 2.8 billion, an increase of 6.93% compared to 2015, accounting for 41% of total export turnover of the country g & SPG;Next to the Chinese market, reaching over $ 1 billion, an increase of 3.82% compared to 2015, accounting for 15% of total exports of the country G & SPG. Besides, exports g & SPG into the Korean market, the UK and Australia also recorded high growth rates in 2016, with an increase of 16.06%, respectively; 6.97% and up 7.6% compared to 2015. In contrast, Japan slipped to 3rd place by the export turnover to this market decreased 5.93% compared with 2015, to $ 980 million accounting for 14% of total exports of the country g & SPG. Besides, exports g & SPG into two main markets are Canada and Germany also visitors decreased compared to 2015, with a fall of 9.34%, respectively, and decreased by 12.8%. 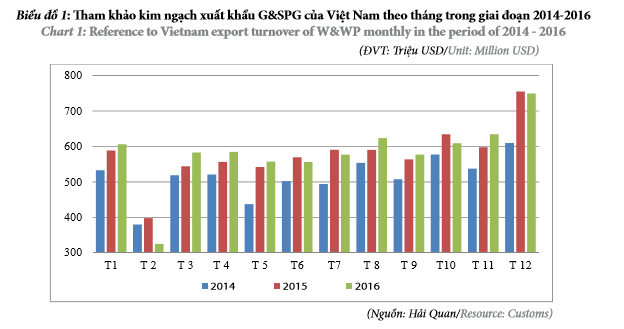 - According to statistics from the General Department of Customs, the import turnover of Vietnam SPG g & South in 2016 fell sharply compared to 2015, reaching $ 1.84 billion, down 15.2%. 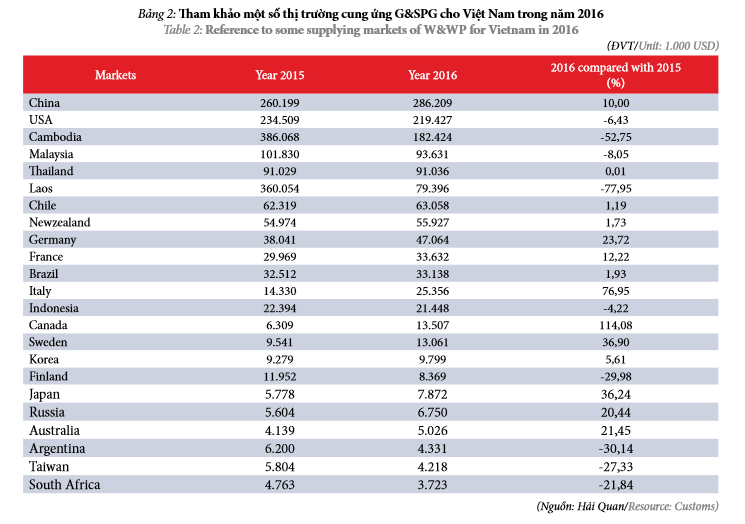 Thus, in the field of import and export g & SPG, Vietnam Nam had a trade surplus of 5.1 billion in 2016. Due to proactive than the source material wood as well as wood products, should imports g & SPG in Vietnam South in 2017 is forecast to remain at low levels. + 2016, imports of the g & SPG FDI reached $ 559 million, down 7.6% compared to 2015, accounting for 30.45% of the total imports of the country g & SPG (this ratio was 27.94% in 2015). in 2016, China continued to be the market supply for g & largest SPG South Vietnam, reached 286 million, up 10% compared to 2015, accounting for 16% of total imports of the country g & SPG. 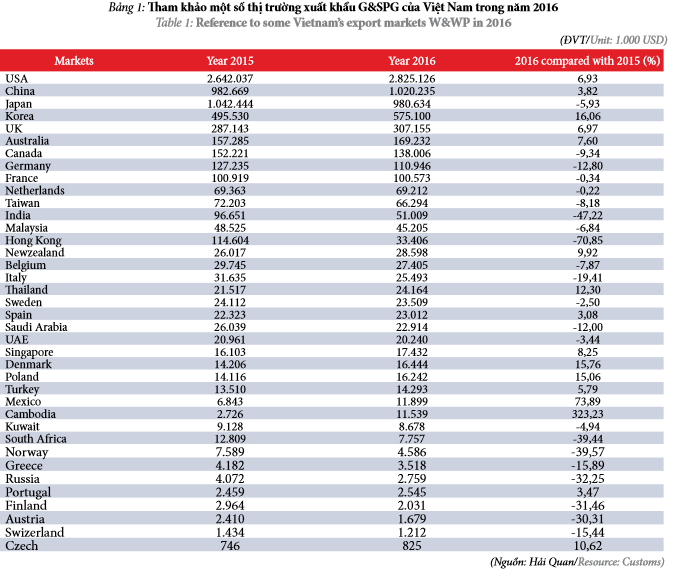 Besides, China is the only market to maintain positive growth in the market supply of g & SPG key for Vietnam in 2016. In contrast, imports g & SPG from Cambodia and Laos to reduce very strong in 2016, with a fall of 52.75% respectively 77.95% and decreased in comparison with 2015.